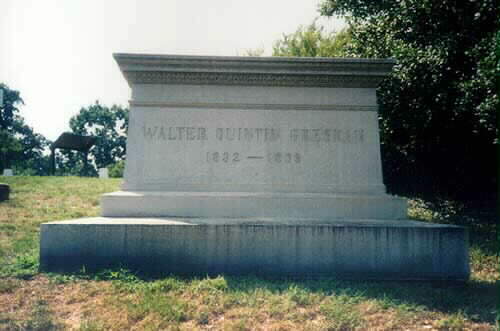 Of English descent, Walter Quinton Gresham was born near the hamlet of Lanesville, Indiana, March 17, 1832. His early life included education in log-cabin schoolhouse, teaching, clerking in the office of a succession of county officials, attendance at nearby seminary and at State University, the study of law, with admission to bar in 1854 and commencement of a successful practice. 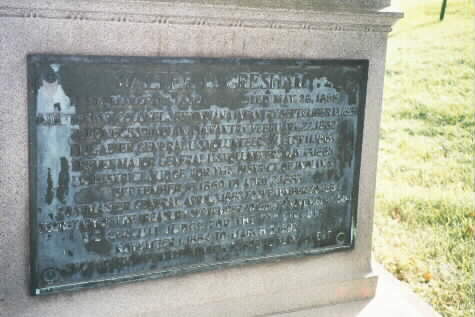 He was moderately opposed to slavery, despite the fact that Corydon, the county seat, was a station on the underground railroad. He campaigned for office a number of times under several party labels, but successful only once. In 1860 he was elected to the Indiana Legislature as Republican. In this capacity he fell out with Governor Oliver P. Morton, but recruited his own Company and on March 10, 1862 was advanced to Colonel of the 53rd Indiana Volunteer Infantry. His regiment was not under fire at Shiloh, but acquitted itself well in the Vicksburg Campaign, where it formed part of Lauman's Division of the XVI Corps. On August 11, 1863, he was appointed a Brigadier Genreal and assigned to command a Brigade of the XVII Corps at Natchez. During Atlanta Campaign he led the 4th Division of the Corps until Jul 20 when knee was smashed by sharpshooters bullet, wound which ended his military career. With a brevet of Major General, he commenced practice of law at New Albany, Indiana, as soon as he could maneuver on crutches. Despite his war record, he was defeated twice for the House of Representatives and once for the United States Senate. In 1883, President Chester A. Arthur appointed him Postmaster General. He served for 18 months, during which he curtailed the Louisiana state lottery by excluding it from the mails. The following year served briefly as Secretary of the Treasury until he accepted appointment as a U.S. Circuit Judge. 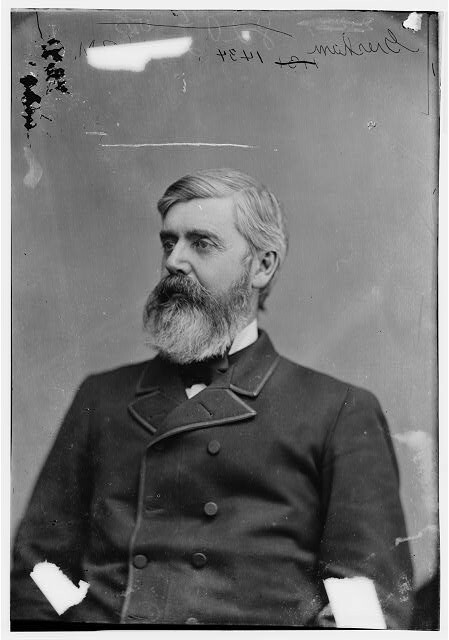 A presidential hopeful at the 1884 and 1888 Republican conventions, he flirted with the Populists in 1892 and in the following year, in reward for supporting Grover Cleveland, he was named Secretary of State. He died in Washington, D.C. during his term of office, on May 28, 1895. He was buried in Section 2 of Arlington National Cemetery. 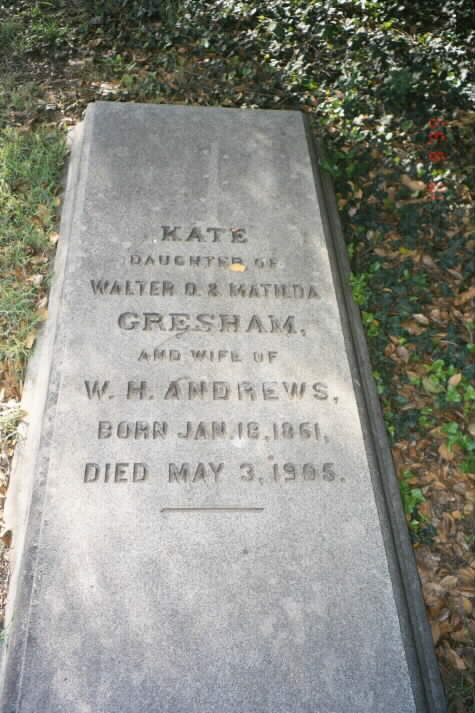 Walter Q. Gresham was born near the small town of Lanesville in Harrison County on March 17, 1832. He received a common school education, then entered Indiana University. After one year, Gresham had to leave his studies due to the lack of money. He taught school for a few terms in Harrison County, then studied law with Judge William A. Porter of Corydon. In 1853, at the age of 21, Gresham was admitted to the bar and began practicing law in the office of Thomas Slaughter in Corydon. In 1860, Walter Gresham was elected to the Indiana House of Representatives. While he was serving in the General Assembly, the Civil War began. He secured a commission in the 38th Indiana Volunteer Infantry. In February, 1852, he was promoted to Colonel and given command of the 53rd Indiana Regiment. He and the 53rd were sent to join General Ulysses S. Grant's army. By the end of the Civil War, Gresham had attained the rank of Major General. Gresham became a federal judge and served as a member of three presidential cabinets. Under President Chester Arthur, Gresham was Postmaster General and Secretary of the Treasury. In 1892, he was named Secretary of State by President Grover Cleveland. He served in that position until his death in 1895. 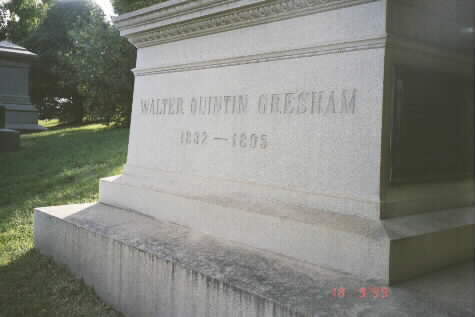 He is buried in Arlington National Cemetery in Washington D.C.
WASHINGTON, May 2, 1896 – President Cleveland and all the members of the Cabinet except Secretary Hoke Smith were at Arlington this afternoon to see the body of General W. Q. Gresham buried in the National Cemetery. They had met the train from Chicago at the railroad station and in several carriages they followed the hearse to the hillside overlooking the Potomac and the Coty of Washington. There were no funeral ceremonies. The weather was cloudy, the air warm and moist. A detachment of cavalrymen from Fort Myer bore the coffin from the hearse to the grave, which had been dug on the slope east of the Lee Mansion and little to the right of the grave of Sheridan. A group of trees make a canopy over the spot, which is near the carriage road. The President and his advisers stood in a line at the right of the grave with heads uncovered while the coffin was lowered. Postmaster General Wilson at the end of the line nearest the grave, and the President at the opposite end of the row, with Secretary Olney next to him. Mrs. Gresham, in deepest mourning, stood forward of the other spectators, leaning on the arm of Otto Gresham, her son. When the coffin had been lowered to its place a bugler sounded “taps” and the friends who had assembled to pay respect to the memory of the brave soldier and just officer turn away to leave the place, as the rain which had threatened began to fall. General Gresham’s grave adds to the number that is gradually dotting the brow of the hill in front of the Arlington House.